Col. John Boudreaux suffered a critical sudden cardiac arrest in 2016. He was dead for several minutes. Less than six percent of out-of-hospital cardiac arrest victims survive the trip to the hospital: His doctors gave him less than one percent. Today, as a group commander at Cannon Air Force Base, N. M., he bears the scars that remind him for every one of him, there are 99 others buried in the ground. Susi thought, what do you do? What am I going to do for John? When was the last time you took care of someone, if ever? What if something happens? Can I keep him from making a turn for the worst? Her eyelids clenched tightly together and a tear escaped, sliding down her cheek. The doctors told her to try the best she could to support John. They constantly reminded her that they have faith in her. They gave instructions on helping him maintain a stable condition. However, they didn’t teach her how to live with someone who had just gone through a traumatic experience that less than one percent of individuals survive. A quadruple heart bypass takes a heavy toll on one’s heart, chest and torso altogether. Especially for John, who experienced an out-of-hospital sudden cardiac arrest. In one week, he had gone from passing his Air Force fitness test to being immobile, drugged up to fight the pain of surgery and unable to walk on his own. She collected herself and stepped out of the car. The cabin lights flicked on, casting a small light on John’s eyes, which made him writhe in his seat, still under the influence of the medication received during a week-long stay at the Virginia Hospital Center in Arlington, Va. She opened the rear passenger door and picked John up from the passenger side. Leaning against each other, arms-around-shoulders, they treaded into the house carefully. Susi gently laid John in the recliner. He squirmed back into it and slowly drifted back into his sleep. She kept her eyes on him to make sure he didn’t flip around in his sleep. The doctors told her that patients who’d just undergone heart bypass surgery could only sleep on their backs. But at that moment, she smiled. He was finally sound asleep in his own home. She took her shoes off, then laid down on the couch in front of him. No more constant heart rate monitor noises or doctors rushing in and out. She felt worry-free in that moment. I will try the best I can, she told herself. John was the younger of two children. His older brother George II was killed in a plane crash just before John left for basic training. His father, George, was a full-blooded Cajun from Louisiana and was a sharecropper’s son, the youngest of 10 siblings himself. George worked the farms until he entered the Air Force in 1950 with an eighth-grade education. His brother was selected to attend the Air Force Academy to become a pilot in 1981, two years after John graduated high school. After graduating, he tried his hand at college before failing out. He worked odd jobs for a few years until he decided to follow in his father’s footsteps and joined the Air Force in 1984. Four weeks before John left for Basic Military Training, his father received a phone call from the Air Force while he was at work in Texas Instruments’ headquarters in Lubbock, Texas. The voice on the other side of the line said his eldest son was killed in a plane crash. John describes him as his best friend and worst enemy growing up. The fights the two got into with each other never could replace the brotherhood they shared. John was already close to his father, and they became closer than ever afterwards. One month later, John departed for six weeks of training at Lackland Air Force Base, Texas. After four years in the Air Force, John had his first date coming up with a girl name Susi. Tall and brunette, she met him at Zweibrücken Air Base, Germany, a small military installation just off the French border. At the time, Susi was a brand-new Airman, living in the dormitories of her first base. Parked in her military dorm parking lot later that night, John gave Susi a kiss before she stepped out of the car. He watched as she walked back up to her room. His car’s clock read 11:30 p.m., which meant he had spent fourteen hours with Susi on their first date together. Butterflies were in his stomach as he started thinking more about being with her. He decided, sitting back in his car staring at her dorm door, it was no longer an ‘if’ and more of a ‘when’ he would marry her. They married eight months later in Susi’s hometown, Kalispell, Mont. The newlywed couple soon departed for their first assignment together at Whiteman AFB, Mo. It was there John decided to buckle down and focus on academics in hopes of becoming an officer. Each school day he left early in the morning and wouldn’t return home until between 10-11 p.m. Susi prepared lunch and dinner for him every day before he left. She couldn’t spend as much time as she wanted with her husband, but she wanted to support him however she could. He obtained his Bachelor of Science degree, majoring in management information systems in 1992 and attended Officer Training School, where he attained distinguished graduate, an accolade earned by the top-tier leaders of cadets’ respective classes. 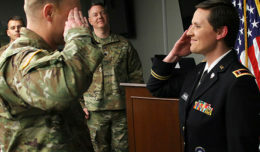 He obtained his commission at the age of 33 in 1995, making him one of the oldest lieutenants in a commissioning class filled with members in their early 20s. In 2008, John was nearing the end of his latest deployment. Ready to return home, he was notified that his mother had a heart attack and suffered multiple strokes. John flew back as quickly as possible. It was days later that, along with his father, the decision was made to pull her off life support and move her to a hospice. They stayed by her side as she slowly drifted away, passing away six hours later. George and his youngest son were all that was left of their globetrotting, close-knit Cajun family. On Sept. 23, 2016, John, now a colonel since July, departed from his home in Alexandria, Va., to his office at the Pentagon. Susi was asleep when he left to take public transportation. Normally, he would have taken his bicycle and worked through the near-marathon distance back and forth as his workout for the day. However, with his Air Force fitness test that week, he was resting his legs for the few days preceding it. John’s role at the Pentagon affected every Airman in his office of 16 individuals and every Airman in their career field. He and his peers ran the career field management office for all cyberspace jobs in the Air Force. He was close with his coworkers. As soon as he walked into his office that day, John greeted everyone before dropping his bag of clothes in the locker room downstairs in the Pentagon Athletic Center. There, he met with the man who was going to record his test results. The PAC provides physical fitness facilities and fellowship for military members and Department of Defense civilians. It was a center John was very familiar with. When he wasn’t biking dozens of miles a week to and from work, he was laboring away to stay fit there. He finished the run in 11:35. After finishing the pushups and sit ups to complete his test, he felt good about his score, and continued walking around to help cool his warm muscles down gradually. The cooldown was followed by a trip inside for some water, then to the bulletin boards by the gymnasium’s racquetball courts. John looked over the vast columns of numbers on the several score sheets to find his age group’s requirements and began adding up the points he got for each test section. He read to himself the score: 96.6 percent. As he stood in front of the bulletin board adding his scores together, he looked down at the bench next to the bulletin board and thought, “Wow, I need to sit down. I think I’m going to pass out.” Soon, like a collapsing tower, his legs gave out from underneath him, his palm landed on the bench and suddenly, his body was on the ground. Not a sliver of movement came from John’s body for minutes. A man spotted John and immediately rushed over to move him. No response. He flipped John on his back and hovered over his still face. As the man’s worried tone became louder, others responded and began taking action. Less than two minutes after receiving the 9-1-1 call, emergency medical technicians arrived at the scene and began working on reviving John’s heart after it had stopped for several minutes. There is a medical term used for when someone’s heart suddenly stops and ceases to beat: sudden death. Wires were sprawled out on the floor. Several EMT bodies were on their knees surrounding John’s body, constantly moving their torsos back and forth from their medical bag back to his chest. His shirt was sliced open and split apart for the defibrillator’s resuscitation electrodes to be placed on his chest and back. After two rounds of CPR, John was brought back from the dead, but his heart was still in critical condition. The medics immediately prepared the defibrillator as the cramped gym room felt even smaller with the crowd growing in size around the scene. The first shock delivered from the Implantable Cardiovascular Defibrillator jolted his body, but John’s heart was still not beating correctly. The medics cleared each other again to ensure they weren’t touching his body before the machine delivered another automatic external defibrillation through John’s chest. The strong shock ripped through his body, causing it to jolt off the ground with each wave of electricity. They paused and monitored John’s pulse. The signs rapidly became more positive for the team. John awoke on the ground, eyes opening to the sight of several medics with masks on. He was asked questions such as where he was, what happened and so on. “Do you know what happened to you, John?” the medic asked. “Yeah, I … I passed out.” John responded. John was still assessing everything, but time wasn’t on his side. After he became stable enough for transportation, the medical team moved him to the ambulance as quickly as they could. They had roughly six miles of traffic to rush through, and even though he was stable, John needed to be given cardiovascular attention soon or he could slip back into critical condition. While he was in the ambulance, however, the team had time to ask him for his contacts. John gave the EMTs his wife’s name and where she lived. He also gave them her phone number, but immediately declared, “Don’t you dare call her!” They asked him for a second emergency contact, so he gave them his father’s information. “But don’t you dare call him!” he said. His responses were based on how the death of his brother was handled. His father was at work when he got the call. Once they arrived at the hospital, John was settled in his room and hooked up to the electrocardiogram for doctors to monitor. This gave him the time to call his wife, who was still oblivious to the situation. “Hey, hon! How’d you do on your PT test?” she asked. John always started off with a lesser version of the truth when something negative happened. It’s part of his efforts to disarm people. “Oh, OK hon. Glad to hear everything is better! So, is it OK if I go work out first?” Susi asked. John chuckled quietly to himself, the irony of the situation was hard to hold back from telling Susi. “I think you should get ready to come here. There’ll be a car at the house soon, Diana is picking you up so you can see me,” John explained. He hung up and waited. He never liked to break the reality of a bad situation with the first phone call, but this situation was unlike any he’s ever had to tell before. To go from waking up next to her husband that morning to being told he died on a gym floor hours later would be unbearable news to her. Once enough time passed, he gave Susi another call. “Hey, are you in the car with Diana right now?” he asked in a somber tone. He explained the cardiac arrest and all he remembered was finishing the test and laying in the hospital bed. Susi began to weep in the passenger seat next to Diana. Laying limp on his cold hospital bed, he felt his throat tighten as he tried to find the right words to say to his hysterical wife. He was unable to hold back the tears. Their voices shook, but they stayed together on the phone until they reunited at the hospital. Together, they talked about what was next and what was going to happen to him. They embraced. He told her he needed to make one more phone call before he does anything else that day. He dialed the digits on his phone and collected himself before sending the call. 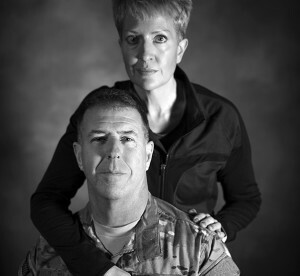 Susi Boudreaux and her husband, Col. John Boudreaux, have been married for over 28 years. In September 2016, John suffered an out-of-hospital cardiac arrest requiring quadruple heart bypass surgery, a situation less than one percent of victims live through. For months, Susi bathed, fed and cared for John as he was incapable from caring for himself. Dye was injected into his chest to show where the blockages in his heart were. The range of severity between the four blocked vessels were vast. Some were 90 percent, others were 60 percent, and one was at 30 percent. The doctors determined he needed to undergo a quadruple heart bypass surgery, the second rarest and most potentially dangerous bypass surgery someone can undergo. He was told his surgeon would be Dr. John W. Rhee, who had four years of cardio, vascular and thoracic surgery experience. John was scheduled to go under the following Monday. Although she was anxious and worried about the operation, Susi was comforted by a visit from Dawn, the widow of John’s brother. They waited out the surgery together. It started at 9 a.m. John was put under anesthesia and surgically cut open from the top of the chest to the sternum. Whereas most heart bypass surgeries involve spreading the ribs apart, Dr. Rhee opted for a less invasive option and left them be. He then connected John’s body to a cardiopulmonary bypass machine, which provided oxygenated blood to it while his heart was shut down for the operation. His body was put in a cooled state of approximately 64 degrees Celsius to allow for the long surgery. 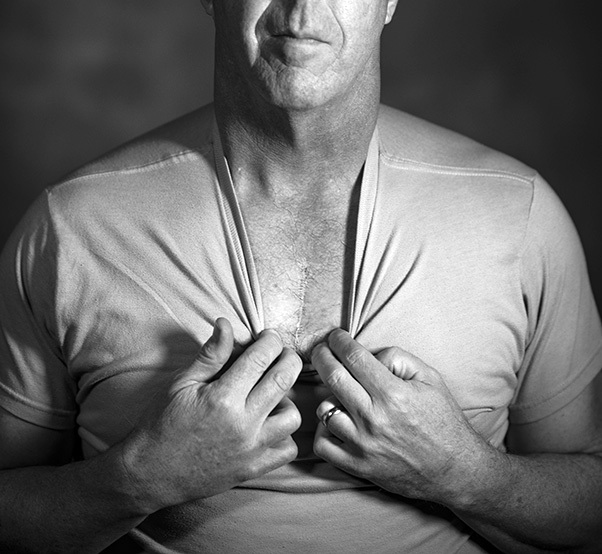 Both of John’s internal mammary arteries were used to reroute part of his heart. They took a piece of his vein and cut it into two pieces. The surgery was completed by 4 p.m. When Dr. Rhee emerged from the surgery, he looked at Susi and told her it would help greatly with his recovery if her husband ate a vegan diet. She laughed; the kind that exuded she was clearly needing a joke to take her mind off everything going on. “Dr. Rhee, that’s not going to happen with John!” Susi said. Soon, he awoke from his medically-induced coma and was aware of his surroundings and actions. His eyes fluttered open to the sight of a member of the medical staff. Get up? You’ve got to be kidding me, John thought to himself. Nurses surrounded him to watch him as he took his first steps out of the bed since surgery. They accommodated him with a cart for support. Tubes were still interwoven in and out of John’s torso. He immediately wanted to reach down and grab his side as he was reminded to take deep breaths. Every time his ribs expanded during a breath in, it felt like someone was digging knives into his sides. John was a sturdily-built man, but he loved to run. He missed the long strides and deep breathes of fresh air. 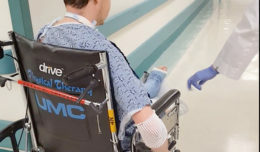 He squeezed on the cart handles and shuffled forward out of his room and to the Step Down Unit, where patients recovering from critical condition are sheltered after becoming stable. “John, you have to breathe!” a doctor told him. “I am!” he abruptly responded. “Smell the flowers and blow out the candles,” the doctor advised. Walking down the hall and to the SDU, he counted his 25 steps; one after another. They were the hardest steps he’d ever taken in his life. He was immediately greeted by Susi and Dawn to help with his abrupt recovery process. The next day, a crowd of people came to visit the Boudreauxs. One particular face, a boss of John’s at the Pentagon, stood out to him when he started greeting visitors. “Hey boss, you missed a great opportunity to give me mouth-to-mouth earlier!” John said. The hall erupted in laughter. A smile cracked John’s face and he chuckled, but was quickly reminded of the tubes jetting out of his chest and sides. This personality was typical of John. When people felt uncomfortable or hurt, he broke the dreariness with a joke. The following Thursday night, he was released from the Virginia Hospital Center to return home and begin his six month recovery phase with Susi. They reminded her of John’s prescriptions and where to pick them up. Finally, they told her they knew she could take care of him, and that if she ever needed anything, they’d help. Furniture was moved downstairs in their home to support John’s immobility. Susi and a close family friend prepared the house for the next six months of living, which, as the staff described, would be a lot to handle. He had the recliner to relax on his back to comfort him as much as possible. But it couldn’t erase the hours of constant pain he would endure. If he tried to lay himself down in bed, sharp pains stabbed at his chest. If he tried to step in the shower by himself, his torso couldn’t twist without pain that felt like someone was ripping his ribs open from the inside. He couldn’t even stand up off a chair or get dressed in the morning without help. For every one of these simple actions, Susi had to be by his side. She didn’t have the medicine to numb his pain like the professionals did. She only had the bottles of medicine prescribed to him that she would pick up. At night, she had to make sure he was only on his back when he slept, so she set up a pillow case around his body to prevent movement mid-sleep. But even then, sleepless nights ensued. She had to stay up and comfort him while the painkillers ate at the lining of his stomach. It was both physically and mentally trying for John. He was a problem solver. But there was no solution to the problems he realized he had once he woke up that first morning back in his home. It was an exhausting first month of recovery. However, his recovery didn’t hit any obstacles. After the second month, he was allowed to walk freely out in public without someone there to assist him. He began to drive himself to cardiac rehabilitation. He worked two days a week at the Pentagon, and the other three weekdays at home. Upon his return, John’s coworkers made sure to help with and monitor him. Although he was sore, he was still able to get the mission done. In the following weeks of rehab and clinic visits, he found out his heart sustained zero damage. His outlook on life had always been positive, but it was a blessing to him. After six months, he returned to work full time, and for the most part, Susi and John’s lives returned to normal. Today, he and Susi live at Cannon AFB, N.M., where John took his first group command position in his career; the 27th Special Operations Mission Support Group. John added, one thing many will learn about cardiac arrest and heart attack survivors is that our emotions are at the surface. It’s very difficult to hide all the feelings that arise when talking about it all. They came up very hard when I returned to the Virginia Hospital Center last February. The staff hugged me. They remembered me. They gave me my life back. And the more I talk to doctors, it seems the odds I shouldn’t have been given a second chance are larger. I am so blessed I had such a great staff, great friends and a wonderful wife.